Thirteen years after the release of Kingdom Hearts II, Kingdom Hearts III is finally available for us to peruse. With over a decade of buildup and hype, this game is a massive undertaking both to play and to review. There's just so much of it. There are a lot of cutscenes, a lot of new abilities, a lot of Disney characters, a lot of hidden Mickeys, and a whole lot of backstory to catch up on if you haven't played all nine of the previous games in the series. It's just a lot in general. Fortunately, Kingdom Hearts III definitely lives up to all the hype. It is beautiful, emotional, and fun to play, but because of its enormous scope, it never lets the player take a breath. Between the endless array of minigames and the endless array of bonus abilities popping up on your screen during battles, it's very difficult to find time to sit back and enjoy the rich and tranquil environments of the Disney movies that you are playing in. For the purposes of this review, I will be focusing mostly on the princess-related aspects of the game, but I cannot emphasize enough how much there is to do and how much sensory overload I went through during this past week of playing it. 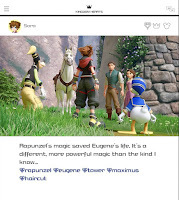 For those of you who are not already familiar with the series, Kingdom Hearts is about a boy named Sora who teams up Donald Duck and Goofy to travel through the worlds of various Disney movies wielding a giant key called a "keyblade" and rescuing classic characters from evil monsters such as the "heartless," which are created from the darkness in people's hearts. That's the simple part. Ever since the first game came out in 2002, the Kingdom Hearts series has been releasing expository games on various consoles that retroactively pile on new plot developments such as cloning, time travel, memory loss, and past lives. 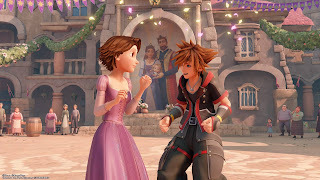 If you want to understand everything that gets referenced within the dialogue of Kingdom Hearts III, you're probably going to need a few months to catch up. I recommend Everglow's timeline on YouTube, which edits together the plot from all of the existing games and movies in chronological order. However, you could also chalk up all expository dialogue in Kingdom Hearts III to mysterious villains being mysterious and just enjoy running around through the worlds of the Disney movies if all you're looking for is some fun gameplay. The Disney Princesses played a pivotal role in the story of the earlier Kingdom Hearts games. Known as the Princesses of Heart, they were sought after by the games' villains for the pure hearts they needed to complete their wicked goal. The original seven Princesses of Heart were Snow White, Cinderella, Aurora, Belle, Jasmine, Alice, and Kairi, who is an original character from the series. 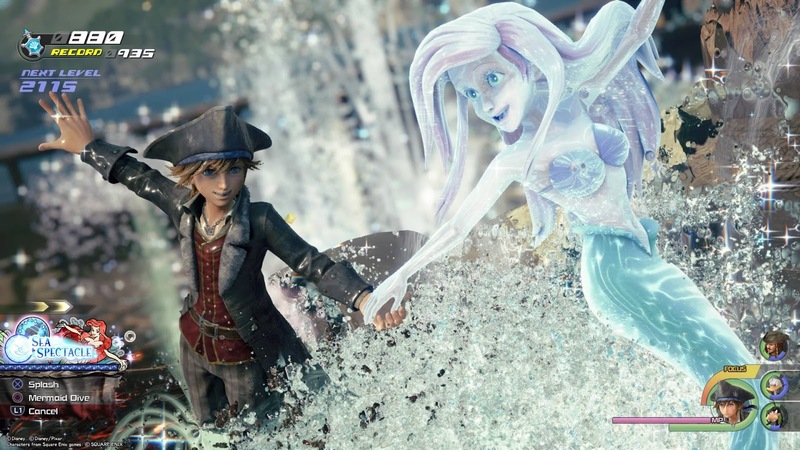 Sadly, Ariel was not given the title of Princess of Heart despite her world being a playable level in both Kingdom Hearts and Kingdom Hearts II. 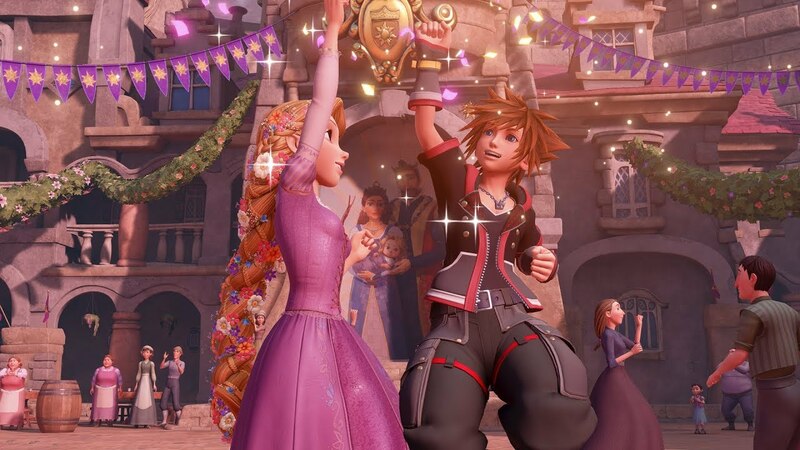 Kingdom Hearts III set up hints about seven new Princesses of Heart meaning the original seven princesses gave their roles to Rapunzel, Elsa, Anna, and... Actually, those are the only three Disney Princesses in this game. It turns out that the new Princesses of Heart were just a failed backup plan in case Sora didn't successfully complete his mission. 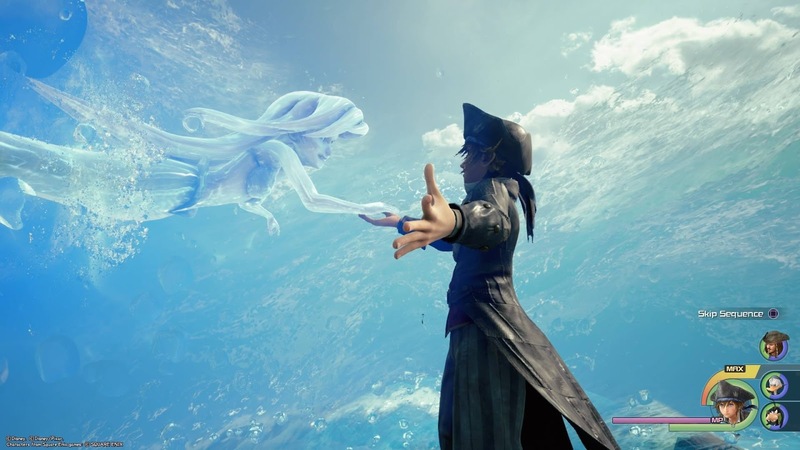 I can't say I wasn't a little disappointed by that, but I was at least glad to see Ariel, my favorite Disney Princess, return in the form of a summon that can be used during battles. 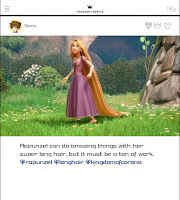 The bulk of the game consists of exploring the worlds from various Disney movies. 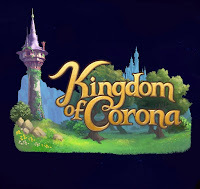 My favorite world in this game was the Kingdom of Corona from the movie Tangled. Scenes from the movie were recreated shot by shot using the video game's graphics engine, which boasts incredible detail on fabric and hair follicles. One criticism I have about the way Kingdom Hearts III portrays Disney movies is that they leave out crucial scenes to the plot and assume that anyone playing has already seen the movie. 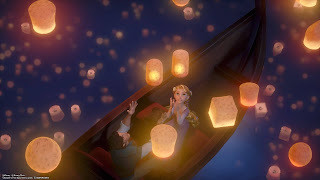 In the Tangled world, nobody bothers telling Sora that Rapunzel has magical hair with healing properties, so when he witnesses the ending of the film, I'm not sure how he's supposed to know why cutting off Rapunzel's hair is a problem or how it turned brown. However, I did like that the world incorporated continuity by allowing you to return to Corona later and repeat a dancing minigame from the village festival with updated animation that matches her new hairstyle. 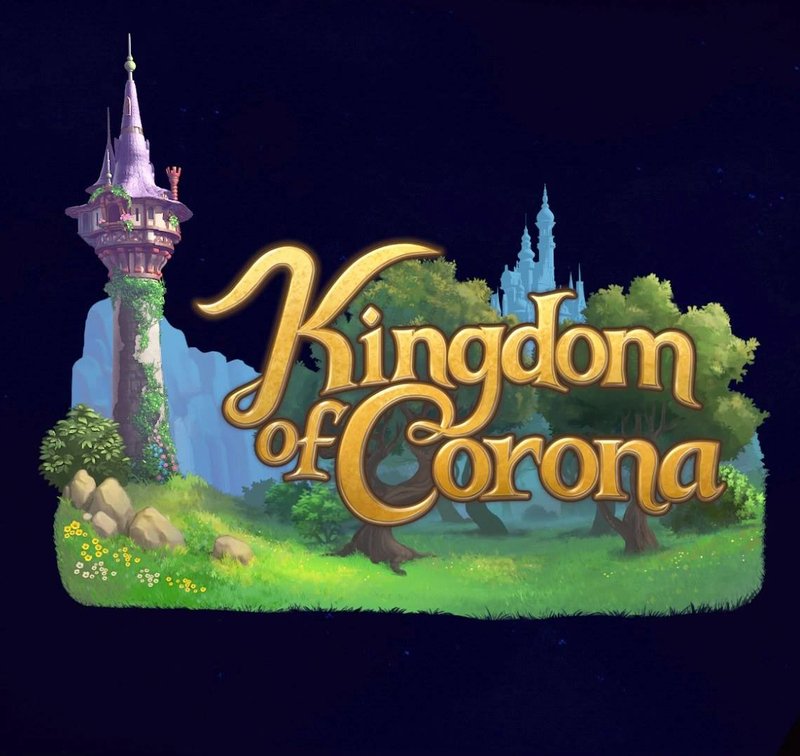 The world of Corona itself is visually stunning with lush flowers, colorful butterflies, and vibrant trees. Rapunzel's excitement to leave her tower for the first time is contagious as she asks Sora to play with her in various natural environments. I also enjoyed exploring the crowded village of Corona during the festival, even though it was rather small compared to the seemingly endless hills and marshes leading up to it. The only other place I wish I could have explored was the inside of Rapunzel's tower. 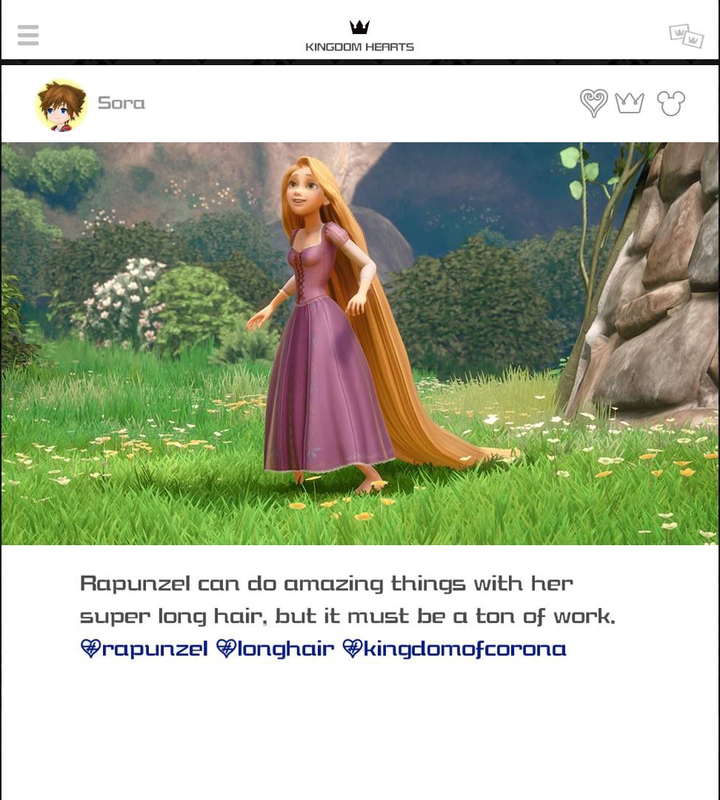 Even though Sora has an ability in Kingdom Hearts III that allows him to effortlessly walk all the way up the tower without needing to climb anyone's hair, there is no way to go inside and admire Rapunzel's beautiful paintings. In fact, something that I noticed about Kingdom Hearts III, in general, is that they place a much bigger emphasis on external environments than internal ones. You can no longer go below deck on pirate ships, and there are no majestic castles to roam through like Hollow Bastion or Beast's Castle from the first two games. The closest thing to an internal environment was Mount Olympus from the movie Hercules, which was admittedly breathtaking. For the most part, though, Kingdom Hearts III is all about running up walls and scaling mountains. 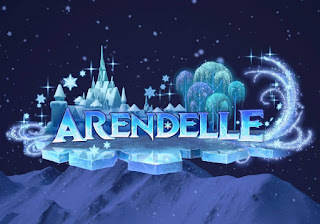 Arendelle from Frozen turned out to be one of my least favorite worlds in Kingdom Hearts III. As much as I would have loved to explore the sparkling interior of Elsa's ice palace, the game gave me nothing but endless labyrinths and snow-covered mountains to explore. It goes on for so long that everything starts to look the same after a while. 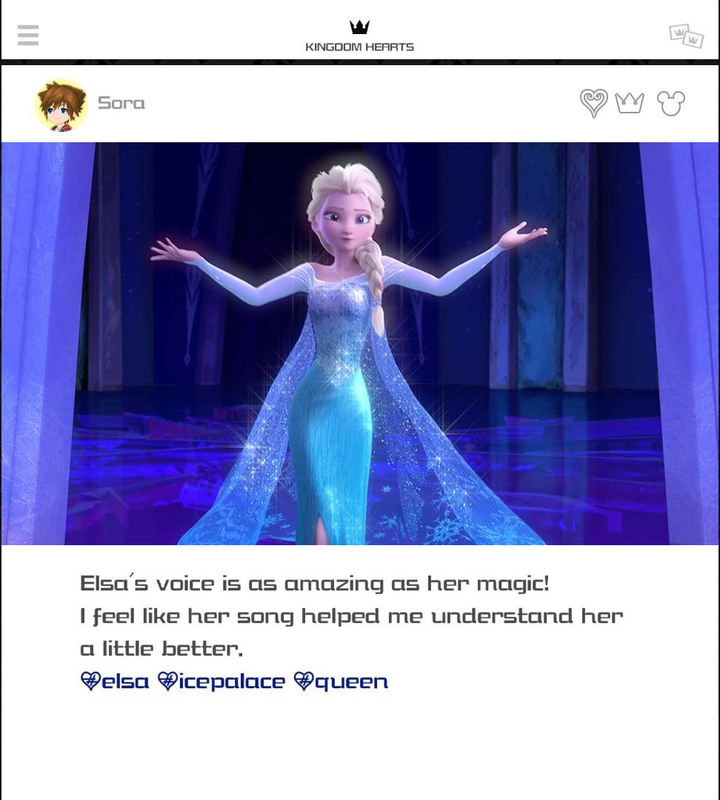 Even though Sora cannot go inside Elsa's ice palace, the entire game stops and forces us to watch a shot-by-shot recreation of the scene where she sings "Let It Go." The. Entire. Flipping. Song. Many of the Disney movies featured in the Kingdom Hearts series are musicals, but this is the first time I have ever seen one of the games stop all the action to watch a character sing a song in its entirety. The world of Atlantica in Kingdom Hearts II did have a series of minigames in which Sora helps the characters sing songs from or inspired by The Little Mermaid, but that worked because it was incorporated into the plot of the game and allowed you to participate in the songs as a player. This, on the other hand, was just Sora watching a scene from the movie that most of us have already witnessed a million times and are probably sick of by now. Not only did I find it jarring, but it also took me out of the game for a few minutes. 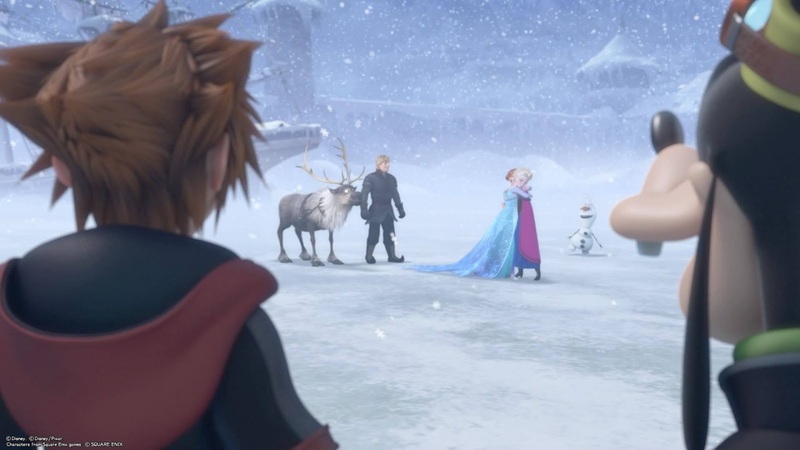 What's worse is that most of the Arendelle world involves Sora running through the snow by himself because unlike Rapunzel and Eugene, neither Anna nor Elsa accompanies him on his journey. The only world I disliked more than Arendelle was Pirates of the Caribbean. Since I never saw the sequels, I had absolutely no idea what was going on story-wise. 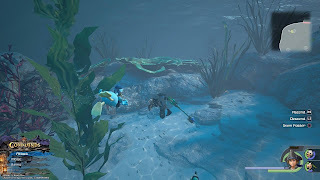 I did like that the world allowed you to swim around and explore underwater environments without having to worry about running out of breath. In that respect, it was similar to Atlantica from the first two games. It is also fitting that these underwater worlds are where you find the Ariel summon. For me, the problem was all of the surface missions you have to do after acquiring a ship. The game forces you to learn an entirely new battle system and then play a sort of minigame where you sail to different islands collecting crabs in order to make your ship strong enough for the final battle. I might have actually enjoyed exploring the islands if the game didn't force me to do so in order to complete the world. It also doesn't let you save at all until after you collect your first 300 crabs, which was particularly frustrating to me because I was ready to take a break by then. There is so much more to this game than what I've mentioned so far that I have barely even scratched the surface. It would probably take weeks of reviews to cover everything. 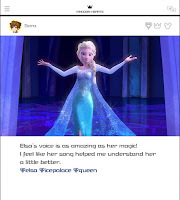 There are the minigames on Sora's gummiphone, hidden Mickey quests, finding ingredients and cooking delicacies in Remy's bistro from Ratatouille, Disney theme park attraction abilities that pop up randomly during battles, and of course, the unfinished backstories of the original characters from previous Kingdom Hearts games. If you want a game experience that never has to end, Kingdom Hearts III is perfect for you. It contains beautiful environments, fun characters, and a rich and complicated history that could take months to unravel. 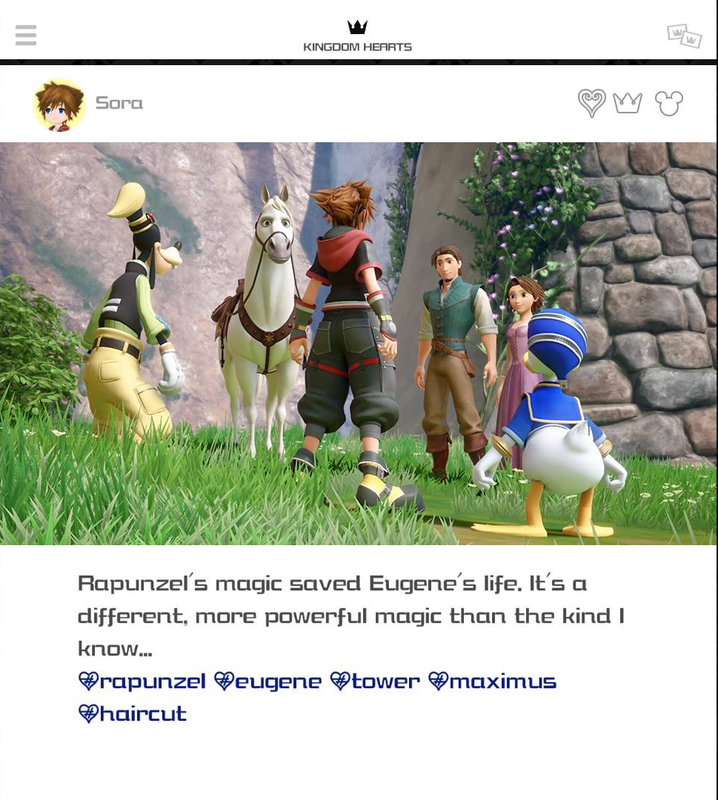 If you love Disney movies and know nothing about Kingdom Hearts, this is still a great game for you. It allows you to interact with your favorite characters and discover their worlds in a way that is unprecedented and a lot of fun. However, I am warning you that Kingdom Hearts III is highly addictive, and playing it too much can cause dizziness, irritability, and a lack of sleep. Now that you've been warned, go ahead and have fun exploring Disney worlds with Sora and his friends!